Story Wall started with petroglyphs and ended with soup. I think that means that I did something right. The idea for Story Wall grew out of my curiosity about how scholars interpret ancient rock engravings. How could anyone in the year 2013 possibly understand the intent of an artist who lived and died thousands of years ago? Navigating the swampy roads of intent and interpretation is, of course, a tricky business in any artistic medium no matter what the distance between the artist and the audience. As an English major, I have spent so much time traipsing through bogs of ambiguous text that the ideas of interpretation and intent are probably never far below the surface of my conscious thoughts. However, this question of petroglyphs threw the intent-interpretation relationship into my mind in a new and exciting way, and I wanted to explore it. Oral storytelling was another source of inspiration for this project. I could tell you that once this petroglyph question entered my head, I got the idea to explore it through storytelling, but that wouldn’t be quite the truth. The truth is that if the museum was going to let me do a project, that project was going to involve stories…because there’s nothing else I could have done. A side effect of being a writer is that you develop crazy notions about stories being the fibers of the universe, which leaves little room for other interests (such as finding a job that does not involve creating more universe fibers). Yet, thinking about petroglyphs put me in a mindset of ancient things, and I found myself pondering one of the oldest forms of storytelling that grew out of cultures all over the world: the spoken tale. In a world in which so many of our current modes of storytelling — film, television, and video games — combine multiple media, I wanted to get back to basics and focus on the power of a single human voice. So those were my grand ideas. Transforming them into something that could function as a drop-in workshop at a children’s museum was where things got tricky. My original idea was to have kids draw pictures of whatever they wanted, post their drawings on a wall, and then interpret any number of drawings on the wall to tell a story. However, after discussing and prototyping this idea with the museum’s education team and my fellow interns, it was clear the workshop needed a bit more structure. The first step in building this structure was to challenge museum visitors to tell a story by using only five drawings from the wall. Next, I needed to create some prompt cards that visitors could use as inspiration for their drawings, a task which proved to be more challenging than I had expected. Because the drawings were meant to serve as inspiration for stories, I figured that the prompt cards for these drawings should contain the building blocks of a narrative. 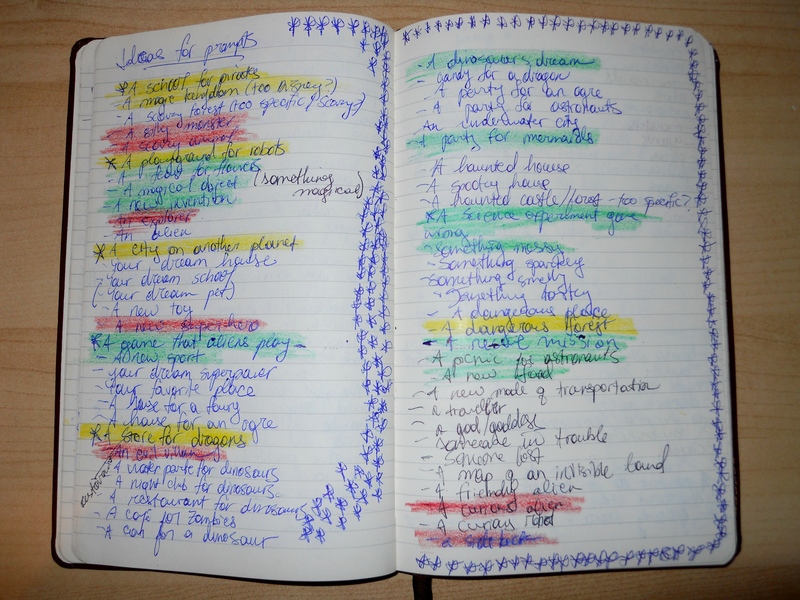 I therefore started brainstorming with the concepts of character, setting, and plot in the back of my mind. My first draft of prompt cards contained topics such as “a school for pirates” and “a picnic for astronauts.” These prompts were problematic for several reasons. For starters, they were difficult to classify. Did the school for pirates belong under the setting or the character category — or did the action taking place there make it a plot element? While worrying whether classifying the prompts as one thing or another would limit visitors’ creativity, I realized a much bigger problem with these prompts: they were already limiting visitors’ creativity because they were too close-ended. Visitors might have different interpretations of what a school for pirates might look like, but they would all be drawing pictures of schools and pirates. For subsequent drafts of prompt cards I focused on narrative archetypes and tried to write about these archetypes in the most open-ended way possible. For example, the prompt card that started out as “a new superhero” became “a hero,” then “someone brave,” and then “a brave character” out of concern that the word “someone” might lead visitors to only draw humans. The “a school for pirates” and “a picnic for astronauts” prompts became the setting cards “a place to learn” and “a place to eat.” I simplified my plot cards to things such as “a journey,” “a prediction,” and “a mix-up” and relabeled them “action cards.” After realizing that it might be awkward and challenging to draw an action, I decided that these cards could provide inspiration when visitors began brainstorming their oral narratives. Finally, I wanted a “stuff” category that would include important narrative elements such as magical objects and food. A coworker suggested that I call this category “artifacts,” and this label had the added benefit of sounding super cool. With my prompt cards finished, I was ready to try out my workshop with the museum’s visitors. However, even minutes before the workshop was about to start, I had no idea what was going to happen. I worried that an activity that had started out lacking structure had become over-structured, and I wondered how kids would respond to the procedure of, “First choose a prompt card from one of these three categories, then draw a picture, then post it on the wall, then choose four other pictures from the wall, then pick another prompt card, and then tell a story. Oh, and let us record it.” At that point, there was nothing I could do but wait and see. Kids of course reacted to the workshop in ways that I never could have predicted. I recorded two amazing stories, but each young storyteller created about ten drawings and then used only his drawings to tell a story. The rest of the participants added drawings to the wall but were not interested in using other people’s drawings to create a narrative. Not sure what to make of this information, I spent the next two weeks wondering how to revise the workshop. The best I could come up with was to rethink the workshop’s physical logistics and reconsider how I would introduce its different steps. Yet, with less than forty-eight hours before the second iteration of Story Wall was scheduled to start, I had a sudden idea: what if, rather than choosing four drawings from the wall, visitors picked four surprise drawings out of a hat?! 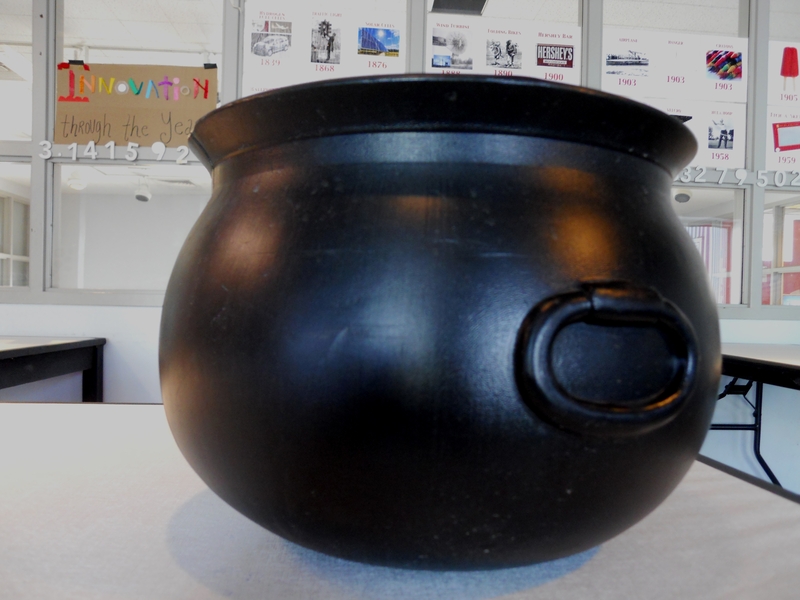 I snagged the black plastic cauldron that was sitting in the corner of the Innovation Lab and decided to test out this idea. The cauldron turned out to be just what my project needed. Picking surprise drawings out of a pot was more fun and less intimidating than trying to choose drawings off a wall covered in other people’s artwork. Having the pictures be a surprise also created a richer creative exercise by adding constraints and by challenging visitors to connect seemingly unrelated images. 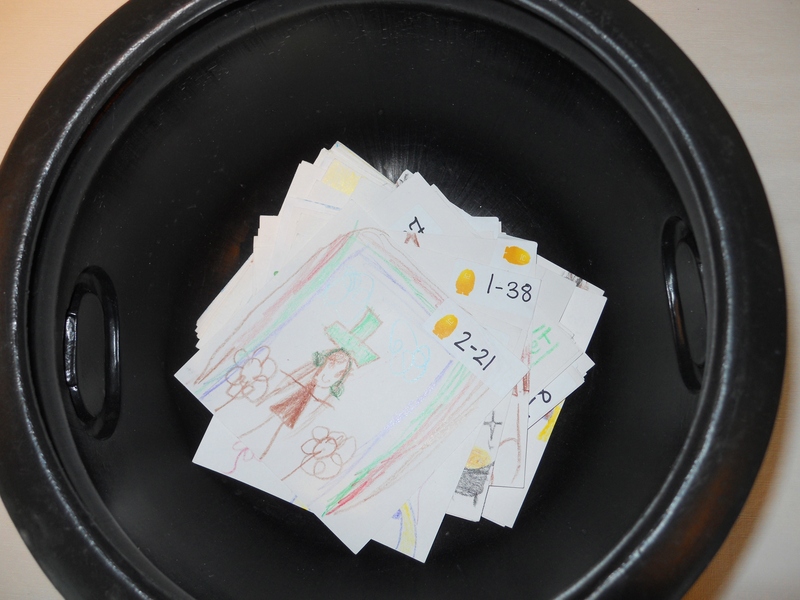 The cauldron also provided the element of collaboration that I had hoped to include in my project, as most visitors were happy to add their drawings to the pot after they had told their stories. 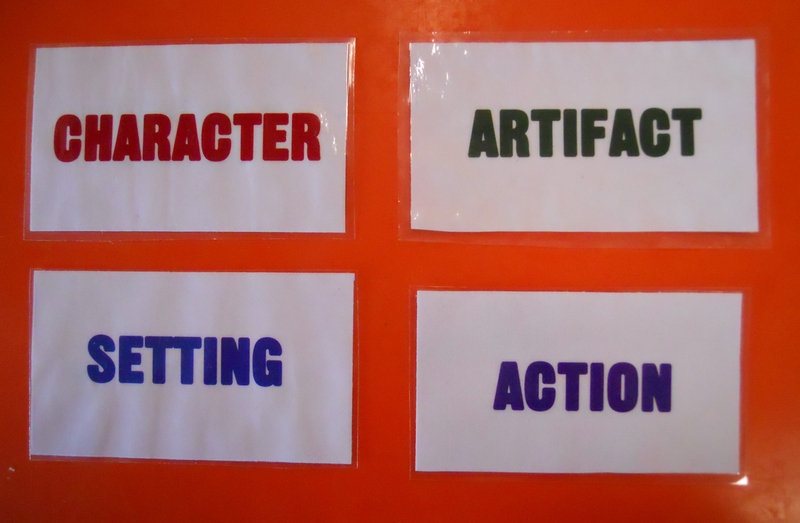 This new method of collaboration provided so much inspiration that visitors had no trouble coming up with narratives; I never even used my action cards! If I could do this project over from the beginning, I would probably name it Story Soup because that plastic pot was the spice and substance that I needed to hold this project together. 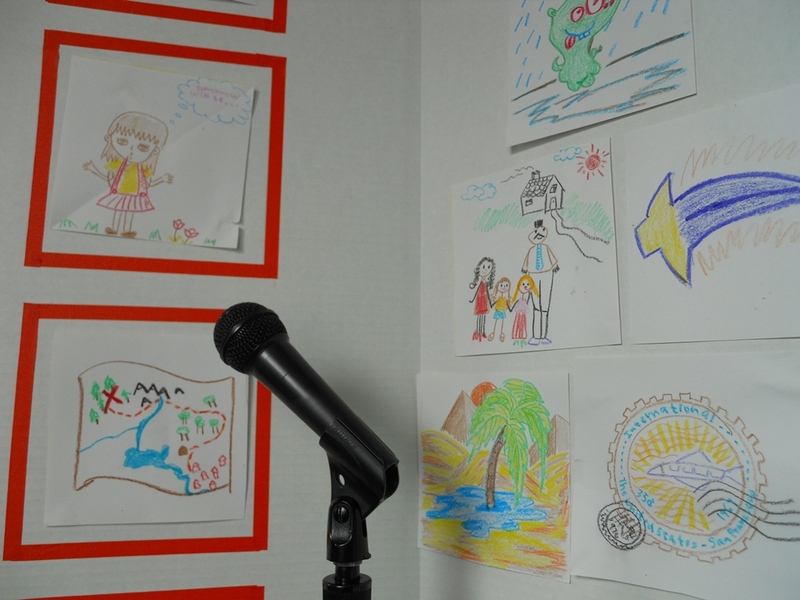 In the end, the wall became the least important element of Story Wall. And that’s okay. Like a story, Story Wall went through many drafts and revisions, and I had to keep chipping away at it until I dug out its core. I hope that the online gallery of drawings and stories will encourage people to reflect on how different folks can interpret the same image in multiple ways, and I am thrilled that visitors had so much fun participating in this creative challenge. Thus ends the story of Story Wall. Remain calm! More stories await you at www.creativity.org/story-wall. This entry was posted in Fellow and Intern Projects, Intern Program, Things We Like, Workshops. Bookmark the permalink. Pretty cool, it remind me of a few games that we use to play in school while we were kids.